In the grand scheme of pop culture collectibles, action figures are a relatively recent point of interest for collectors. Since the first superheroes were produced in the 1970s and following the massive success of franchises like Star Wars, G.I. Joe, and He-Man, action figure collecting has become a fun and lucrative hobby for many people around the world. In 2015, the action figure marketplace was worth about $1.5 billion and accounted for roughly 7% of all toy sales in the United States. Beyond these traditional retail outlets, comic book conventions are overflowing with new and vintage figures for collectors to sift through. If you’re hoping to get a piece of this pie, there are a few things you’re going to need to know before diving in. This quick guide will help you navigate the waters and make sure you get the most for your dollar. 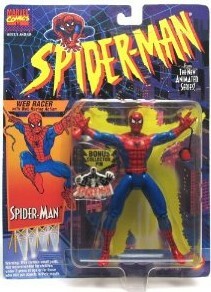 The first thing one should learn about collecting action figures is the major terms associated with this hobby. The abbreviations and common verbiage listed below often tell you a great deal about the product you’re interested in buying and are commonly found within the headlines of online auctions. # Back - This term helps collectors know the age of the figure in question. Some popular figures, like Luke Skywalker, are produced for many years so this designation helps you find the oldest version. 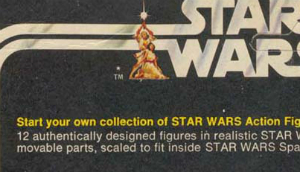 If the first wave of Star Wars figures had 12 characters, all of those would say “collect all 12” on the back of the package. These are known as “12 Backs” to most collectors. If ten more figures are released, the package will now read “collect all 22” and these figures are now known as “22 Backs” even though the first 12 are still identical. So, if you’re buying a "Luke Skywalker 76 Back" for the same price as you bought a "Luke Skywalker 12 Back," you’re probably being hosed. Graded - Just like comic books and trading cards, action figures can be professionally graded. Not only does this authenticate the product and preserve the condition of the packaging but it helps eliminate the doubt you may have when dealing with so many variables in the market. Sticking exclusively to graded figures is a personal choice (and one that will add considerable expense to your endeavor) but it is one that collectors should seriously consider, at least on their cornerstone pieces. Action Figure Authority (AFA) is the main grading option. Loose - Figures that are not in any type of box. MIB - This is an abbreviation for "Mint In Box" and, with the exception of an Altoids container, tells the collector two very important things: the product is in the original packaging and the figure and packaging are in perfect, flawless, immaculate condition. Beware the seller who abuses this term. If there is a blemish, bend, fold, crease, water stain, dent, scratch, or any other type of defect, it is not “mint” but that does not mean it’s not valuable. MOC - This is an abbreviation for "Mint On Card" which has the same standards as MIB but for action figures released on blister packs with cardboard backings. POA - "Points Of Articulation" are simply the parts of an action figure that move. This is often used to help differentiate eras or molds of certain similar characters. For example, you may find that a Darth Vader figure with five POA is worth more than the figure with four POA. Series/Wave - Long-running action figure lines come out in waves (hence the # back) sometimes spanning several years and the term "Series" or "Wave" is often used interchangeably to mean the same thing. If Kenner releases the first 12 Star Wars figures in January, that is wave one. If they release another ten in June, that is wave two. Sometimes these waves are associated with packaging changes. An example of which would be a trading card being included in the first three waves but replaced by a collector coin in wave four. Ok, it’ll be pretty rare to find a life-size figure (although there are some statues online that do fit that scale) but the rest are pretty standard. The 1:18 and 1:12 scales have a little wiggle room in dimensions but remain the same scale. Much the same as comics and cards, action figures should be stored in mild conditions and away from extreme heat, cold, or humidity. If you’re storing loose figures in bags, it is critical to use acid free materials and stay away from common household bags you may buy at the grocery store. 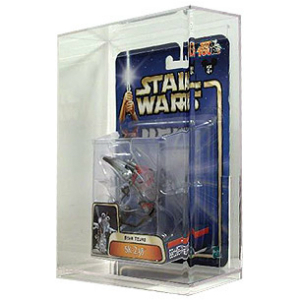 You can also purchase acrylic cases for boxed figures which will prevent the cardboard from becoming bent or wearing and make stacking much easier for storage. Of course, you can always display your collection in a cabinet or on shelves but it is important to do so in a way that will not damage the packaging or expose the figure to extended sunlight that will fade the colors. Ultra Pro has several different storage options that would be ideally suited for action figures. Always be certain to verify the sizing specifics. As with any collection, the prices and values of each item you desire is going to change a million times for a million different reasons. Ultimately, the figures are worth what you’re willing to pay for them and while there are price guides available for reference, your best reference is simply looking for what other similar products have sold for in the past. eBay is the best option for this as you can plug in the specifics you are looking for based on the terms above and view all sold items during the last few months that fit this criteria. The search will likely require some fine-tuning but once it is perfected, you can also use it to keep track of new listings to surface. When doing your research, though, remember that a 12 back will not be worth the same as a 22 back, MIB is not worth the same as loose, and graded is not typically worth the same as ungraded. This hobby can be fun and challenging and provide the active collector with a thrilling treasure hunt but don’t be fooled by what appears to be a good deal. Do your homework and your collection will be all the better for it.